Born in the Transylvanian city of Sepsiszentgyörgy, Hungarian bass Bálint Szabó graduated from the Gheorge Dima Music Academy in Cluj-Napoca in 1997 and completed his studies at the International Vocal Arts Institute in New York and at the Israeli Vocal Arts Institute in Tel-Aviv. Among his victories in vocal competitions are the Nicolae Bretan Competition in Cluj-Napoca, 1996 (second prize) and the International Vocal Contest in Budapest, 1998 (first prize). Between 1990 and 1995 he was a soloist at the Cluj-Napoca State Hungarian Opera and since 1996 he has been a soloist at the Romanian State Opera, as well as a permanent guest soloist at the Hungarian National Opera in Budapest. In 2004 he was honoured by the Romanian Government with the title of Knight of the Order for Merit in the arts and culture. He had an exclusive contract with the Hamburgische Staatsoper from 2003 to 2005. From the 2005 to the 2009 season he was a member of the Oper Frankfurt. Over the last ten years he has performed as Filippo II in Don Carlo, Selim in Il turco in Italia, Sparafucile in Rigoletto, and Publio in La clemenza di Tito at the Hamburgische Staatsoper; Zaccaria in Nabucco at the New Israeli Opera Tel Aviv and at the Passionstheater Oberammergau; the King of Egypt in Aida at the Macerata Opera Festival; Méphistophélès in Faust at the Deutsche Oper am Rhein and at the Romanian National Opera in Timișoara; Enrico VIII in Anna Bolena and Don de Silva in Ernani at the Klangvokal Festival in Dortmund; Sparafucile in Rigoletto and the Monk in Don Carlo at the Théâtre du Capitole de Toulouse; Alfonso d’Este in Lucrezia Borgia at the Gran Teatre del Liceu in Barcelona and Teatro Municipal de Santiago de Chile; Don Ferrando in Fidelio at the Théâtre des Champs-Elysées in Paris, Fiesco in Simon Boccanegra and Sir Giorgio in I puritani at the Greek National Opera. 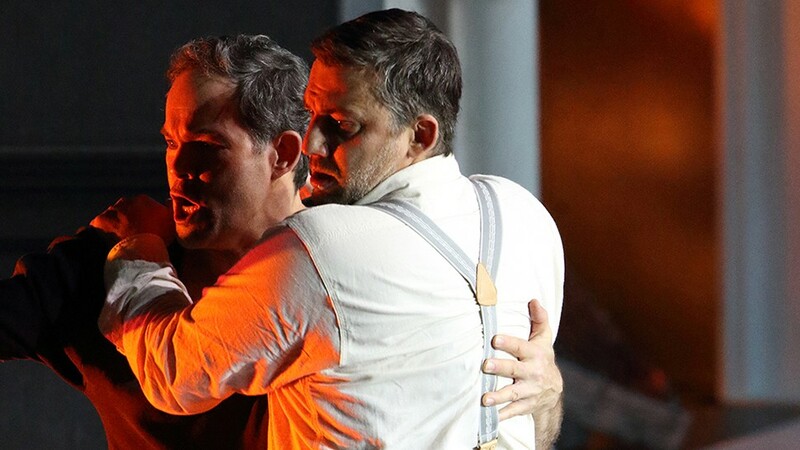 He has taken up the title role in Bluebeard’s Castle for the Budapest National Opera (the show was also recorded on DVD), at the Teatro Municipal de Santiago de Chile, and at the Théâtre du Capitole de Toulouse. He sung it numerous times in a concert version – with the Royal Concertgebouw Orchestra under Iván Fisher at the Concertgebouw in Amsterdam; with the Royal Symphony Orchestra under Charles Dutoit at the Festival de Musique Classique Montreux-Vevey and in the NHK Hall Tokyo, as well as at the Great Hall of the Moscow State Conservatory within the frameworks of the Opera Apriori International Festival under Pavel Sorokin. He has also sung Publio in La clemenza di Tito, the Monk in Don Carlos and Surin in Pique Dame at the Opéra National de Paris (Palais Garnier/Opéra Bastille); Procida in Les vêpres siciliennes at De Nederlandse Opera (subsequently released on DVD) and at the Grand Théâtre de Genève; Douglas in La donna del lago at the Grand Théâtre de Genève and at the Teatro alla Scala di Milano; Walter in Luisa Miller at the Buxton Festival and the Oper Stuttgart; Tom in Un ballo in maschera and Don Prudenzio in Il viaggio a Reims at the Opéra de Monte Carlo; Sarastro in Die Zauberflöte with the Opéra national du Rhin (in Strasbourg, Colmar and Mulhouse) and at the Opéra de Nice; Lodovico in Otello, Tom in Un ballo in maschera, Filippo II in Don Carlo, Sid in La fanciulla del West (released on CD), Fiesco in Simon Boccanegra, Méphistophélès in Faust, Colline in La Bohème, Banco in Macbeth, Raimondo in Lucia di Lammermoor, Zaccaria in Nabucco, Sarastro in Die Zauberflöte, Don Profondo in Il viaggio a Reims, King Louis VI in Euryanthe, and the title role in Don Giovanni at the Oper Frankfurt; Ramfis in Aida and the Bonzе in Madama Butterfly at the Soirées Lyriques de Sanxay; the Prefetto in Linda di Chamounix at the Royal Opera House (also released on CD); and Stromminger in La Wally at the Grand Théâtre de Genève. He has worked with such conductors as Maurizio Benini, Ádám Fischer, Sir Mark Elder, Carlo Rizzi, Carlo Franci, Tomáš Netopil, Tugan Sokhiev, Rani Calderon, and others. Among stage directors Bálint has collaborated with Peter Konwitschny, Christof Loy, Stefan Herheim, Nicolas Joel, Pier Luigi Pizzi, Willy Decker, Mariame Clément, Aurélien Bory and Jean-Louis Pichon to name just a few. Speaking fluently six languages which allow him to master a wide operatic repertoire, Bálint feels himself at home at any place, residing in Germany since 2003.